In the third article of the series “Hum Blogistani!” where various bloggers are doing some self-contemplation we present Charu’s take on the theme. Charu suggests that the Indiblogdom, with its growing size, should start focusing on the content, do away with the “personal” journals and shed inhibitions of blogging about one’s profession. Charukesi Ramadurai is a Mumbai based independent qualitative research consultant and one of the popular female bloggers of Indiblogdom. Her blog “A time to reflect” was adjudged the best new Indiblog at the Indibloggies 2003 and is one of the widely read and respected blogs. Charu also blogs at Mindspace and Mediamusings, a collablog on the Indian media scene. post reminiscent of the Indian blogosphere's journey so far - the idea struck home immediately. For, I am forever reminiscing about the "good old days" of Indian blogging. The good old days, meaning a couple of years ago when there were fewer bloggers, more personal interaction between the bloggers, and certainly lesser nastiness. I guess, with size comes other complications. I have been blogging for over two years now, and these two years have been extremely rewarding. From being a space to park my random thoughts, my blog has now become a space that triggers many new thoughts and ideas, mainly through the comments and discussions around the posts. I have met some wonderful people, online and later offline, people who otherwise would never be part of my life. And I am sure it is the same for most of us bloggers. At the same time, I can sense a definite change in the space over this time. My feelings as I see the Indian blog space expand so quickly and so much are mixed. I watch with a somewhat amused and fond look (if that sounds pompous, I admit it but I take my “old blogger” status seriously! ); I see the space grow larger than I ever thought possible, and feeling a little perplexed by it too. Rarely do I come across a blog that stands out from the rest in terms of content or focus. Perplexed because despite the growth in terms of numbers, Indian blogs and bloggers have not been able to make their mark in the larger space out there. And I often wonder about it. In my opinion, one of the reasons for this is the lack of “specialist” blogs coming out of India. Every day, I discover new blogs, new thoughts and new styles of writing. Most of them are good, and a few exceptional enough to make me want to go back. However, rarely do I come across a blog that stands out from the rest in terms of content or focus. I think the future of blogging lies in such specialist blogs. The world over, blogs that are making an impact have a clear focus. They may be about a social cause or about a technical subject or professional interest, but they maintain that focus throughout. In addition, it goes a long way in establishing their "expert status" in that space. In India, I know there is a lot of concern about blogging about ideas relating to one's work and profession. However, I think bloggers need to come to terms with this concern and attempt to reach out to larger audiences across the world. Sure, writing about local politics is fun, reading about it too, but for how long? In that sense, the way "weblog" is defined by most of mainstream media, as "personal online journals" still holds true. Blog’s potential to reach has not been realized by most of us here. Blogs have a lot more potential to reach out, to make an impact, to attract global readership, but that potential has not been realized by most of us here. I see the way ahead opening up for those who use the blogosphere as their space to create differentiation for themselves; in advertising terms, a USP that marks them apart from the others. A space to whet their ideas and hone their skills in their specific areas of interest and / or expertise. And not just, a little of this and a little of that, a blog bhelpuri. Then, and only then can bloggers make a difference in that larger space out there, the internet, and not just in the blogosphere. We invite all Indibloggers to share their thoughts with us. If you feel strongly about the theme of this series, don't hesitate to send us a short writeup at indibloggies at gmail dot com and we would be glad to publish it. Please note that the piece sent to us cannot be cross-posted to any other website, though you may link to here. Thanks! Smiling Charu !!! Good to see the birth of Mindspace too. Interesting pointer about clearly focussed, specialist blogs. 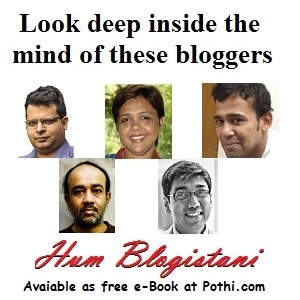 I did'nt know about Indibloggies till today, chanced upon to you via desipundit. Wow! I really liked the bhelpuri :-), that of the specialist blog. Fully agree with you on this. I am thinking about a write-up now something on traditional Indian home cooking. Cheers! Vow Ru, to be called a Specialist Blogger. That's great. Why don't you start a blog on some of the current issues. Everyone's talking about the Jessica Lall case, but think of the famous Priyadarshini Mattoo case in which the judge felt helpless(!?) to nail the accused and let him go scot free - now to practice law!! !Imagine what will happen if the accused in the Mattoo case, now practising as a Lawyer in Tees Hazari Court, appears before the same judge.